Uefa president Michel Platini and the G14 body of top European clubs are close to a deal that will give the group more say in the game's running. In the past, Platini has called for the G14 to disband, but the 18-strong group is now set to expand to 77 clubs and replace Uefa's European Club Forum. "The big clubs consider the 102-strong club Forum is an ineffective talking shop," said 5 Live's Brian Alexander. Arsenal, Liverpool and Manchester United are all members of G14. Chelsea are expected to turn down an invitation to join the group, but Newcastle, Spurs and Celtic could be new members. The G14 group are due to meet on 21 December, to confirm their plan to expand and replace the existing Forum. "The new organisation will be totally independent of Uefa and will have a real say on the contentious issues, such as player compensation while on international duty," added Alexander. "It will also have a say on the establishment of an international fixture calendar that doesn't disrupt the domestic league seasons too much. 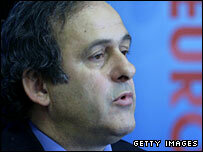 "Talks between Michel Platini and G14 general manager Kurth are ongoing but I understand a deal is not far off. "The new organisation will represent a far bigger church of European clubs and will have a real say in how Uefa is run and makes decisions." The G14 group has come into conflict with world governing body Fifa over its support for a number of court actions to gain compensation for players injured whilst on international duty. Belgian club Charleroi have taken Fifa to the European Court of Justice over a player who was injured while on international duty. Charleroi want compensation after Abdelmajid Oulmers was ruled out for eight months after being injured while on duty for Morocco. The G14 is also seeking a share of the revenue generated by the Euro 2008 finals. "We are hopeful of a deal with Uefa," said Kurth. "We believe awarding the clubs a share of the revenue generated by the competition would recognise the contribution the clubs make to international football. "It would not just be G14 clubs benefiting but all clubs with players in the finals. "Hopefully this will be agreed before the start of the finals and could lead to a memorandum of understanding being signed next year."